June 4, 2010 - Airman Jake Rodenhaber and his friend Airman Michael Hejmanowski were hiking near Bruneau Canyon, Boise, Idaho when Rodenhaber fell and plunged into the Canyon. Hejmanowski ran 10 miles to seek help and by nightfall ground rescue squads were unable to find him. Air Methods' Pilot, Jim Wright was dispatched to transport Rodenhaber, who had managed to call 911 from his cell phone, to the hospital. The cell coverage was weak in the canyon. Ground crews were searching in the area where Hejmanowski had left his friend to find help. Spotlights powered by generators flooded the canyon below, but they were unable to locate him. "When I arrived I saw all the ground crew lights, and saw the efforts that were underway," said Wright. "I instructed the ground crew to shut off all generators, lights and equipment. We would try to call the cell phone and use a bull horn to instruct airman Rodenhaber to turn his cell phone towards the helicopter." Wright and his team were there to transport Rodenhaber and were not a search and rescue team. No other helicopters were in the vicinity. The helicopter took off about a quarter of a mile from the site and made a pass through the area. Upon following Wright's instructions, he was able to pinpoint Rodenhaber's location using the ASU night vision goggles. "I would not have been able to spot him without the goggles from ASU. I was able to see the light source from his phone. It was like spotting a black tire in the middle of the desert. The ground crew could not see him because he was concealed by an overhang." Once locating him, Wright turned on his spotlight and radioed the rescue squad below. He flashed his lights to let Rodenhaber know that he had been found. The technology alone did not save him, but also the initial training from ASU and ongoing training from Air Methods as well. 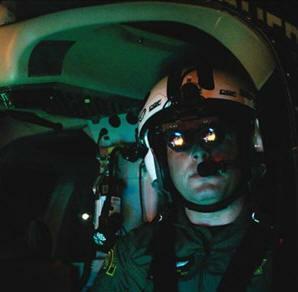 "ASU's training taught us how to fly safely using the night vision goggles. They also taught us when to use our lights and when not to, about depth perception, scanning techniques and normal safety procedures with night vision goggles. They did an excellent job training us." The recent rescue reiterates the need for night vision goggles to be used for night flights. "This Airman was in our home town and I am glad our training and equipment helped to save his life," said ASU founder and President Mike Atwood. "This is a prime example of why night vision goggles are so important to the safety and security of night flights." "Night Vision Goggles are singlehandedly the greatest safety innovation being used today," said Wright. "We have been using them for five years now. I am so glad that Air Methods was an early adopter of using this equipment. Someday this will become a standard for all night flights." Eleven hours after his fall, ground crews successfully retrieved Rodenhaber where Air Methods transported him to the nearest hospital. He continues to recover. Aviation Specialties Unlimited (ASU)'s goal is to implement night vision into the civil aviation market to increase operational safety and improve mission capabilities.